As if I-35 traffic through Temple wasn't hairy enough, crews will be shutting down one of the northbound lanes Saturday night. The good news is that we'll have two new exits and some new pavement once it's reopened. TxDOT's Ken Roberts said the closure will take place from 8 PM Saturday, March 2nd to 11:45 AM Sunday. One northbound lane between Exit 302 (Nugent Avenue) and North Loop 363 will be shutdown as crews stripe new pavement, reset a concrete barrier, and shift northbound traffic onto the new pavement one lane at a time. Note: The temporary Exit 304 to North Loop 363 will be closing permanently. Once the work is complete, there'll be two new northbound lanes open from Baker Boulevard to North Loop 363. 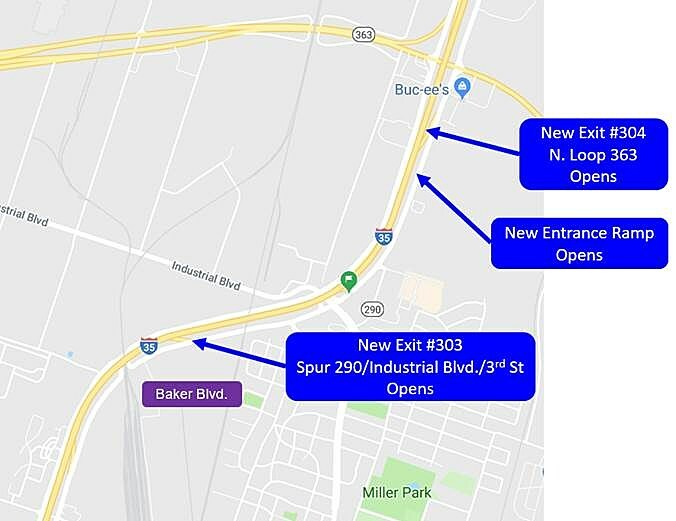 There'll also be a new permanent Exit 303 to Spur 290/Industrial Boulevard/North 3rd St and a new Exit 304 to North Loop 363. You'll also notice a permanent new North Loop 363 entrance ramp. Of course, all of this depends on the weather cooperating. So far, there don't seem to be any signs that it won't. We recommend using Loop 363 to drive around the mess entirely, but if you must pass through, be sure to watch for warning signs and shifts in traffic as the work's being done. Most importantly, watch for workers and keep an eye on your speed. The map below illustrates where the new features will be. Click or tap here for a larger image.